Disclosure: I received a free product in exchange for writing this review. 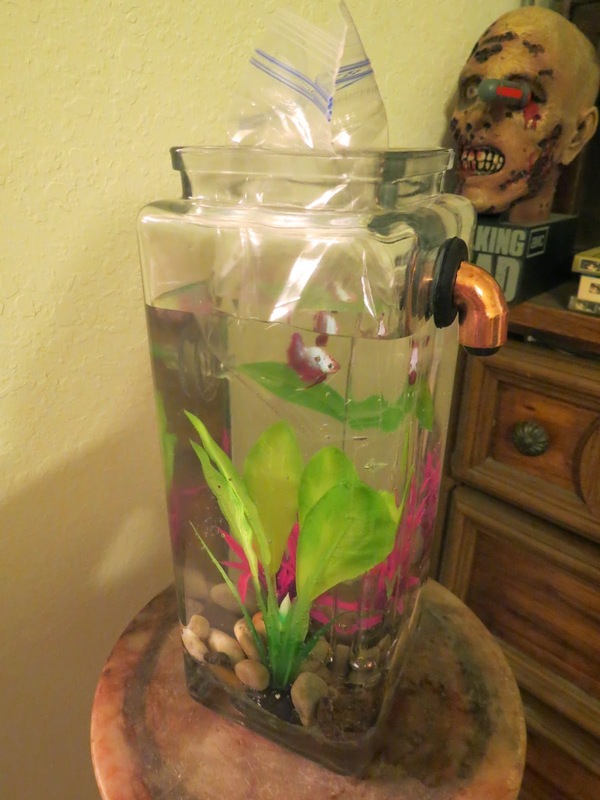 When I was about 12 years old, I got my first small aquarium that included about 10 goldfish. Within about a week, all of them had died. I was horrified, and swore I would never have anything to do with fish again. I had come to the conclusion, that I never was, and never would be a fish person, at a very young age. That was until I saw the "NoCleanAquarium." After working out a review opportunity with them, I decided I would give fish a go, just one more time. A few months later, and I have a plethora of fish! It all started when my NoCleanAquarium arrived. I did my research first, and then got all of the necessary supplies to go along for the set-up. I didn't need too much to go with it, as it already came with an LED light, and the rocks. I just got some special water, plants, food, etc. And I know you don't think I forgot the fish, right?? Of course not! 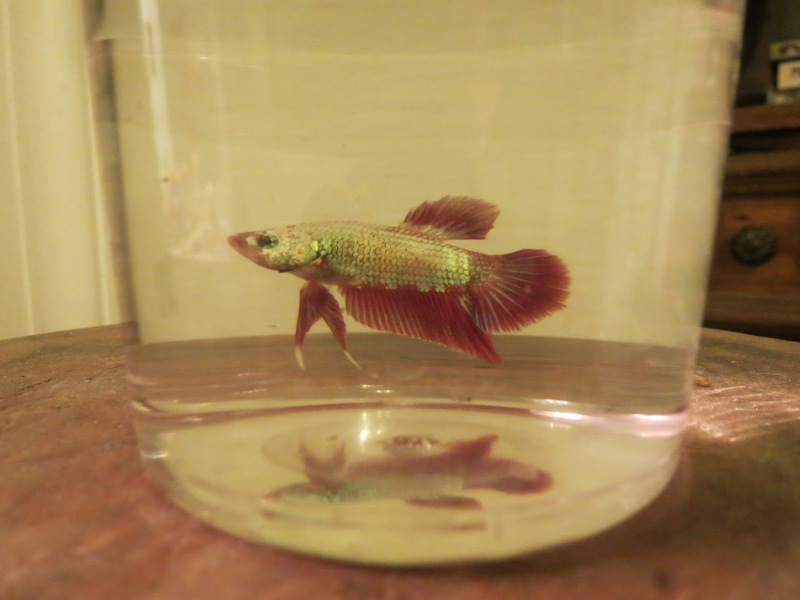 It was hard to choose, but I ended up picking a beautiful male Betta. I named him Lemmy. I had Lemmy floating for about an hour and a half to two hours, and then I finally released him completely into the cage. He was pretty still for a bit, trying to take in his surroundings, but after a little while, he was swimming around like he was comfortable at home! Now - What makes this aquarium so revolutionary, is the cleaning process. When you pour in new water, the old water will pour out of the spout. So you simply place a cup underneath, and collect it to flush. I had been adding new water sometimes everyday, and at least once every other day. In the picture above, you can see the water pouring out, and then the dirt that it picked up - Which after one day, was just a few pieces. After having Lemmy for a couple months, and realizing that with the right tools, I can keep fish, and keep them happy - I added more fish to my collection. I now have 5 Betta fish (all in separate aquariums of course) 2 of which are in nicely established 10g tanks (One has two snail tank mates.) And just yesterday, I purchased a 37g aquarium, so I can start my first community of fish! I am so excited, and will definitely update you guys on a Wordy Wednesday once I have it all set up! Overall? I love the NoCleanAquarium. It brought out a love for fish, that I never knew I had - And I love that the it features a chic look, and features easy maintenance. With NoCleanAquariums anyone can be a natural with fish! Disclosure: I received a free tank in exchange for writing this review. All opinions expressed within this review are my own, and were not influenced in any way. That's awesome, I stopped having fish because it was so difficult to keep the tank clean and I spent so much time cleaning it. This is a great idea. I've never heard of the NoCleanAquarium before. Having to clean it and change out the water has always been the main reason why I didn't ever have any fish. This NoCleanAquarium would make my life a lot easier! The No Clean Aquarium definitely sounds like a time saver and I'm sure it makes for healthier fish too! Oh wow that tank is cool! 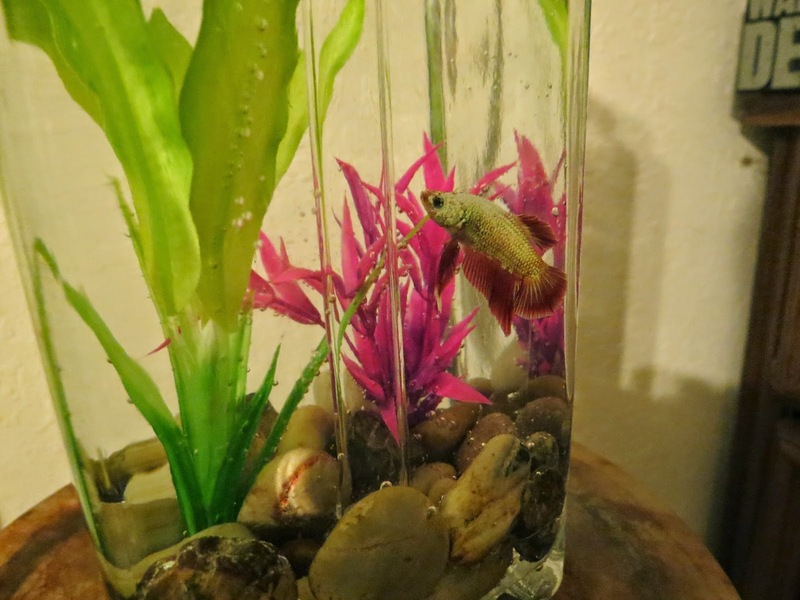 My husband and kids want fish but it always seemed like just another thing I would end up caring for. This might be a great option for us! My husband and kids want fish but I have been hesitant because I felt like it was just another thing that I would end up taking care of. But this may be a great option for us! Oh, I loved fish when I was younger, but the cleaning part.. I can't do it now, I have too much other spaces to clean. This tank is a cool idea! Maintaining an aquarium is very difficult so the no clean aquarium really helps. Awww, I had these fish growing up because my parents didn't like pets. His name was Tibus. They make great pets. that is cool, I should check this out for my boys they want a fish but I have said no because I don't want to be the one cleaning it! This a great creative outlet. I bet taking care of the fish is like my experience with gardening or talking to plants lol. This sounds like a really need product to try out, especially for younger kids! Love the bright coral and the cool fish tank! thanks for sharing. it's been awhile since our last pet fish and with your post, I now want to have another one! Oh my gosh what a wonderful idea this sure does make things easy. Maybe now I can let my little one have that fish he has been wanting. Reminds me of Finding Nemo.. lol That's pretty sweet.. never had a fish, but we had a turtle, too much work went into those things. wow! that tank is really beautiful! my niece has a couple of gold fish that, believe it or not, have lived for about 2 years now! they really need a bigger tank as they have grown bigger than any gold fish i have ever seen. her mom hates cleaning the tank so i will tell her about this. i know she would love it! Awesome tool. One of the reasons I don't keep is because of the cleaning. I love that this tank keeps that to a minimum! Now that's an awesome one - we needed something like this on our home too. that fixes the worst part about owning a fish! Wow, that does look exceptionally clean! I wish I would have had one of these years ago! It would have saved me so much cleaning time! That is great. I hated to clean my son's tank out so I got rid of it after a while. We have 4 aquariums and they're so much fun aren't they? I've never heard of this before though. I used to have this huge tank that would literally take hours to clean. I ended up getting rid of it because of the amount of time it took. Next time, I will be getting a no clean aquarium for sure. I've never heard of this kind of tank. Much better than the hard to clean ones. I have never heard about this kind of fish tank. 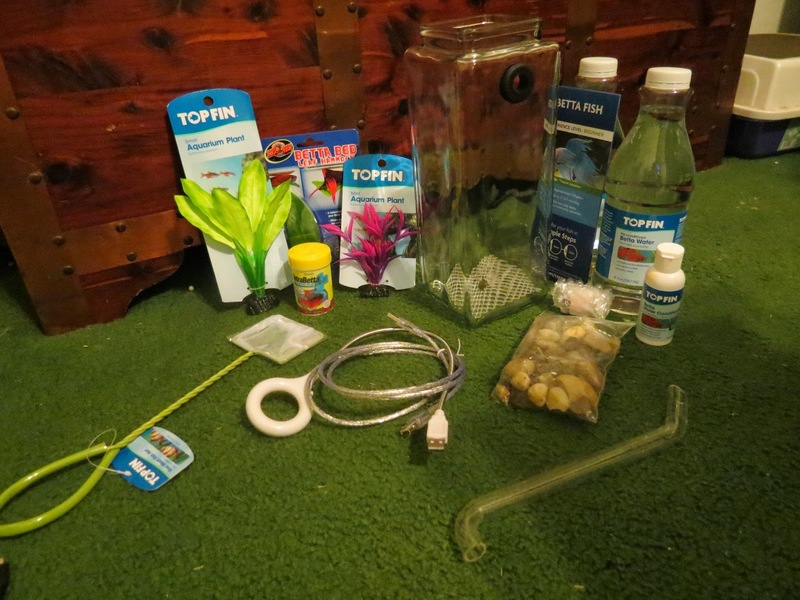 I would love to try it out, I would like to have an aquarium again but never liked the constant cleaning needed. Thanks for sharing. My father in law has ponds.. it is so hard to keep them going and clean.. He cleans them 4 times a week in the summer..
WOW this is awesome! I love that they are smaller as we have very little space for an aquarium so we have been without but the kids are dying for one. I LOVE the no/easy to clean feature and I will be picking this up for my sons birthday! Thanks for the awesome tip, the kids are going to LOVE this! This is a really nice idea for a little kid! I always had fish growing up, but as an adult I've avoided it because of the work involved in cleaning! 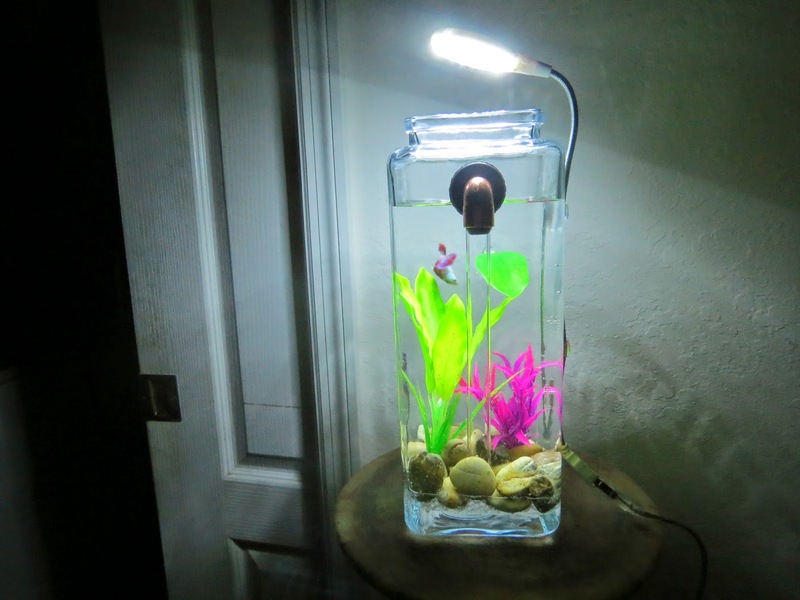 my daughter wants to have a small aquarium, and while I know how relaxing they can be to watch, I also remember the constant cleanings and unfortunate results if I wasn't vigilant in doing so... this looks like a great idea, and might just be something I can get for my daughter which will make cleanup easy. My inlaws have a fish bowl and she seems to always be cleaning it, that or the fish are ill. This sounds like it might be a winner for a gift for her. that's amazing! i love fish but i don't own any because i absolutely hate cleaning out a tank , smells gross, dirty, and i lack the time with two toddlers.....i might have to give this a try! We used to keep fish, but hated to have to keep cleaning the tank. I might have to give the NoCleanAquarium a try. Nice review. Coolest thing ever. I don't have fish because couldn't keep clean. May give this a try! I have a tank - wish it looked so clear! My husband has a few tanks, so I must tell them about these tanks, he might be interested! One of my friend have Aquarium and she says that tank takes so much time to clean it and to take care of all Fishes .. So I have never brought Fishes tank ..
My cousin spends hours on hand organizing his guppies, breeding them and cleaning that darn tank. It really must be a hobby for him because I would have to get this tank that you have and deal with it the easy way! *And Lemmy is so cute! That's a neat trick, I gotta say though I still don't want to get fish just because I don't want to deal with the tank clean up, even with this innovation. This is a really cool idea as I know how hard it can be to get a fish tank clean. Having an aquarium that you don't have to clean would be great. 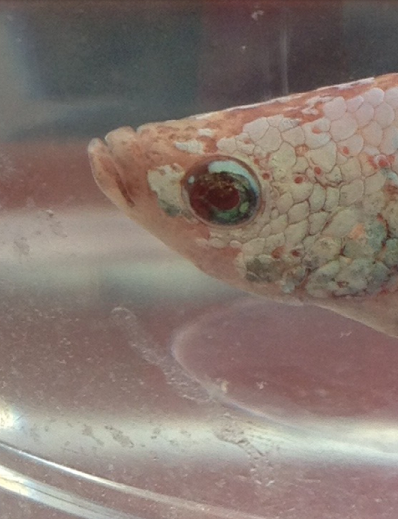 It is necessary to cleanup the aquarium on a regular basis, otherwise it will be harmful for fish. Thanks for making this Blog & create awareness for the people who love their aquarium and their fish. I would love less work in cleaning a fish tank. I had three gold fish when I was a kid and haven't had any lately since I'm short on time, so this is perfect.